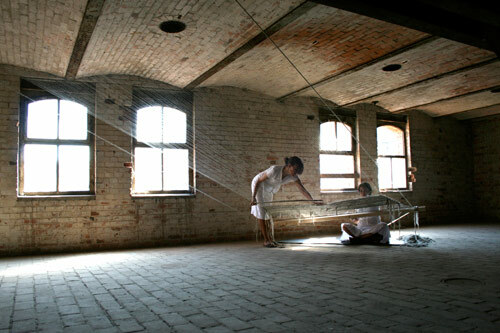 2008 | Performance / installation. Self-spun sheep wool, linen and wood. Taking the story of Penelope –Odysseus’ wife– as a reference point, this work underlines the activities that take place in a factory: dull and repetitive labour. While waiting for her husband’s return, Penelope wove a burial shroud for Odysseus’ elderly father during the daytime and unravelled it at night, in order to delay having to marry again. During the performance I wove stitch by stitch part of a shroud, which at the same time was being unravelled by my performance partner to add a futile dimension to the piece. 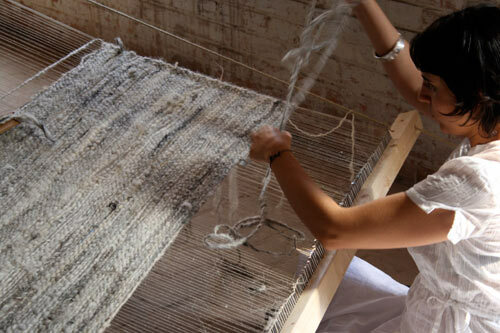 For me the monotonous act of weaving was analogous to the repetitive assembly line production of the workers in the old factory. In a rapidly changing world where much human labour is replaced by machines, beginning with early industrial machines to our present day symbiotic relationship with computers and digital systems; I wanted to raise the question of what is actually, tangibly being created out of all the endless activity in our lives.